Rock 'N' Roll Is Alive! 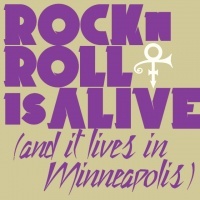 (And It Lives In Minneapolis) was a single released posthumously in April 2019. A 7" vinyl single was distributed to all attendees at the Minnesota Timberwolves NBA basketball game in Minneapolis' Target Center against the Miami Heat on 5 April 2019. The distribution took place as part of the last in a Prince-themed series of special events throughout the season (the posthumous formation of the New Power Generation performed during the game's half-time show). 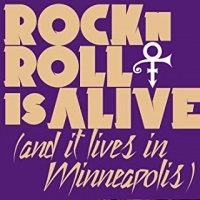 Paired with the title track, the inclusion on the vinyl single of Calhoun Square, which was named after the Calhoun Square shopping district, highlighted Prince's love for Minneapolis. On the same day, the single was made available in all usual digital outlets, without the b-side. The track had not previously been available on digital outlets (although the video had been officially added to Youtube five months earlier). The title track was originally released as the b-side to Gold, the second commercial single to be released from Prince's 17th album The Gold Experience, and was written and recorded as a response to Lenny Kravitz's hit song Rock And Roll Is Dead. While the digital releases were listed under the name "Prince", the vinyl release and the artwork continued using the name under which Prince recorded both songs, , with no mention of "Prince" other than in the "Prince Estate." This record was not released in CD format. This record was not released in any other format. Two weeks prior to the single's release, the Minnesota Timberwolves released a 30-second video promoting the upcoming vinyl giveaway. This page was last modified on 18 April 2019, at 09:56.